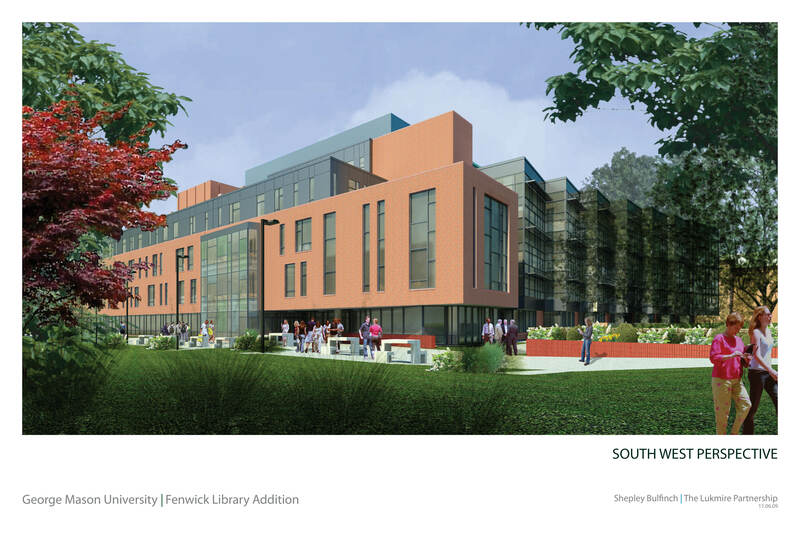 Architectural drawing of the planned Fenwick Library addition on George Mason University's Fairfax, Virginia campus looking southwest, November 6, 2009. Rights : This work may be protected by copyright laws and is provided for educational and research purposes only. Any infringing use may be subject to disciplinary action and/or civil or criminal liability as provided by law. If you believe that you are the rights-holder and object to Mason’s use of this image, please contact speccoll@gmu.edu. Citation: Shepley Bullfinch Architects , “George Mason University: Fenwick Library addition southwest perspective, November 6, 2009 ,” A History of George Mason University, accessed April 23, 2019, https://ahistoryofmason.gmu.edu/items/show/338.